There are a lot of resorts in the Saud Beach area and usually, you can choose the resort upon your arrival. The rocky west end of Saud Beach usually offers affordable accommodation. If your intent is to just use the room to sleep and take a bath, then don’t spend too much money on getting a high end resort. We have stayed in resorts just with basic amenities and just use it a base for traveling to the different awesome places within the area. We also stayed in Saud Beach report which is the high-end resort in Saud Beach owned by the Mayor and we decided to just stay and enjoy Saud at that time so it was worth it. 1. Saud Beach Resort — High End Resort amidst a coconut plantation with nice wooden floors and bamboo furniture. 2. Villa del Mar — If you want a deluxe cottage with stone floors and capiz-shell windows. 3. Apo Idon — One of the nicest resorts in Pagudpud with appealing rooms made of stone walls and good lighting. 4. Terra Rika Beach Resort — One of the popular relatively affordable resort with a nice restaurant. 5. Northridge Resort – Sister company of Terra Rika and Apo Idon located in the West End. 1. Pannzian Beach and Mountain Resort – located near the long, black sand beach of Pansian often beaten by strong winds. 2. Kapuluan Vista Resort – The resort possesses a distinctive, contemporary design and décor that creates both a high-energy and serene ambiance on a casual setting. This is located near Blue Lagoon. So, to answer the question of where to stay? If you want a resort with all the urban amenities and expect to stay with first class accommodations, you should stay in Saud Beach Resort. For a romantic place, I suggest that you book in Apo Idon. If you are on a budget, canvass your way from the different resorts in the rocky-shore west end of Saud Beach. If it is your 3rd time in Pagudpud, I suggest you try Kapuluan Vista Resort. 2. What and Where to Eat? Ilocos Bagnet (P300! ), Grilled Fish (P220) and Pinakbet (P200)!! 1. To save on food expenses, I suggest that you bring your own gallon of water or buy one before entering into the Saud beach resorts. Also, you can buy your own canned goods or instant noodles if you really want to save. 2. Pick the best restaurants to eat from. Unfortunately, I don’t have a recommendation since most of them looks the same. Maybe, you have any suggestions on where to eat in Pagudpud? 3. Avoid the Ilocos specialties like Bagnet which is not healthy and at the same time, they would charge more for these. 4. Btw, there are no nightlife in Pagudpud. People usually spend the evening singing the night away or drinking and enjoying the time with friends. So make sure that you savor your dinner and just relax. regarding PLACES TO STAY… One of the most popular resort in pagudpud is POLARIS BEACH RESORT personally i’ve never been here before but this is where we’ll stay on march 2007 during our ILOCOS NORTE HERITAGE TOUR..
hello! we were in pagudpud oct 2006 and stayed in polaris beach resort. we paid 1500 for an aircon room with cable tv that is good for 6 persons (there are three double beds). the staff people are very friendly and accomodating (especially ate mhe ann). we had adobo for our baon and they were nice enough to heat it for us, even let us borrow plates and utensils! for dinner, you can buy fresh seafood from the local fishermen and have it cooked for a minimal charge (100 i think). we also brought canned goods and they cooked it for us =) there’s also a videoke but it’s only open til 10pm, which is a good thing actually so other people can get a good rest and not be disturbed by the noise. we’re planning a trip to pagudpud this month. just learned recently that there is a resort (kapuluan) in the area of blue lagoon which we intend to visit. Do u advise staying there (as the blogs i’ve been reading point to blue lagoon as the better beach compared to saud) or would staying in the more popular saud area be more practical? We are a group of 7 adults and 7 kids. How does Polaris compare with Villa del Mar? Would really appreciate some tips. Thanks! hi anton.. my boyfriend and i are going to pagudpud probably last week of may. do u have any place u can suggest? preferably nice but not that expensive? we are planning to stay there for 3 days and 2 nights. thank u! been to pagudpud last month… there are resorts that offer tent accomodations… real cool and cheaper if you really enjoy the outdoor experience. enjoy a bonfire. affordable drinks. ihaw ihaw… man. this is cool. but if going with a huge budget then take the best accommodations available. Things constantly change. Good accommodations like Apo Idon Beach Hotel go best. Apo Idon Beach Hotel claims to be the Pagudpud’s best place to stay. This is manifested thru facilities of well appointed spacious rooms with tasteful and classy touches of Philippine tradition, with amenities of satellite cable tv, personal ref, hot shower, etc. The swimming pool is best for couples, families and barkadas to bond in merriment. The recent upgrades in the restaurant enhanced more of its ambience, with clean restrooms, and now wi-fi ready! Fun and great, tasteful and classy, in a compact spot in the Saud White Beach Cove. You are welcome to visit us to enjoy, have fun, and feel great! HI. we’re planning a trip to pagudpud on July. Do you have any place u can suggest or a resort to stay? We are a group of more than ten adults. How does blue lagoon compared to Saud beach? Hi! We were in Pagudpud last weekend from May 19-21. We didn’t have any hotel reservation so we somehow had a hard time looking for a place. Polaris was supposed to be our first choice but it was fully booked at that time. Villa Del Mar didn’t entertain us cause they only accept those that had an early booking with them. Check in time for most of the hotels is from 1-2PM. We arrived at around 8:00 AM so we had no choice but to look for another place that would allow an early check in. We stayed at Northridge Resort for 2 nights. The rate is Php1,000.00 per night. It has 2 queen-sized beds (I think) and a restroom. Nothing fancy at all. It’s actually an affordable place just for sleeping. This place is ok if you really are on a tight budget and is not just after the hotel and its amenities. I just arrived with five of my friends from Pagudpud to spend part our long semestral break. We stayed in Polaris beach resort… and what an experience it was. The staff were very, very friendly and maasikaso specially Everette and Romy. The owner was also very accomodating, Miss Mhe anne. We brought our own supplies and they understood that we are on a tight budget (first timers kasi!) so they provided us and cooked our provisions for a very minimal fee. Kaya we never regretted giving the staff tip for the services rendered. For a quiet, affordable and comfortable place to stay in Pagudpud, look for Polaris. hi! do you have any contact nos of the polaries beach resort>? I appreciate your efforts in putting up this informative guide and promoting the awesome places we have in Ilocos Norte. Enjoyed reading your notes on Pagudpud. Your surname is Diaz, am I right? I believe you’ve got a lot of relatives in Paoay, or maybe your roots are from the place? The one who owns the Herencia area infront of Paoay St. Augustine Church is Mr. Mike Diaz and he has also a newly constructed arcade adjacent to his brother Bob’s hotel infront of the town hall. They are relatives of the town mayor, and I bet, yours, too. 5. Cape Bojeador in Burgos – probably the tallest and oldest of the lighthouses in the country. The outside walls seem to be painted white but in reality it is not. It is limestone plastered by the breeze of air from the sea? Going up the winding stairs, about 200 steps (? ), is tiresome for those with weak lungs but once you reach the top, the view is even more breath-takingly awesome! 9. For those who enjoy kayaking, the town of Adams is your place. Adams is nestled in the eastern mountains of the province bounded by Apayao, about 18 kms inwards from the Pagudpud highway. The place is relatively unexplored, more so of its people. But would you believe that there is a cellsite in this remotest town of the province? For those looking for cheap places to stay in Pagudpud, there are quite a number of homestays in Saud accredited by the Department of Tourism. The rate is really affordable. I learned it is only P250.00/head as of this writing. You may opt to rent the whole house, and you can even arrange with the house-owner for some kitchen utensils and cook your own food at minimal cost. You may get in touch with the tourism officer of the town for the list. There is a place in Balaoi (the locals call it Gao-oa pronounced as gaw-wa) going towards Cagayan where you can buy fresh catch. Talakitok sells around P120 to P180, depending on the time of the year; yellow fin tuna between P70 to P100. Priced catch are the crustaceans. Just make use of your bargaining ability :-). There’s a restaurant in the town proper of Pagudpud, it is called Papa Nard’s, east of the town hall. They serve home-style cooked food. The sinigang is superb. Relatively cheap. I hope these pointers would be of help. You are most welcome to visit and re-visit Ilocos Norte. me and my friends are going to pagudpod this week…we will leave here in baguio around 2am on friday…is it possible to look for a hotel knowing that its christmas season?there will be lots of people so i hope there are available hotels when we arrive…we are on a tight budget because we really dont know how much we should spend coz we just planned it last week…hehehe…i was just surprised that there is no night life there but we’ll might as well start 1…hehehe…i hope that we won’t be organized because it’s our first time to go there…and if anyone is going to pagudpod this weekend or friday,can you please holla at me and maybe we can be together???ayt!!! I just want to say thank you for this very helpful and informative forum. My friends and I are planning to go to Pagudpod next week and because of this forum, I have gotten enough information to plan our trip. Polaris, sounded very interesting so, I called Steve and reserved a room already. Indeed, he was very pleasant and accommodating. Thanks for the tip. Oh, one more thing, I would appreciate it also, if there is anyone who can tell us the way (by car) going to Pagudpod? We plan to have side trips also… hopefully, along the way. I heard it’s about an 8-10-hour trip going there if we know the way… and 10-12 if we don’t… sayang din yung 2 hours, weekend lang kami eh. Thanks again everyone for the info. May we all have a bountiful and happy new year! I read email of L.V. Chee…am interested in HOMESTAYS in Saud accredited by Dept. of tourism…how do I get their contact nos. would appreciate assistance cause we are planning to go to Pagudpud sometime end of April. Are you going to stay there at Pagudpud? I suggest you stay or eat at Polaris. Mura food at masarap din. paluto kayo. Php50 lang paluto.kayo bahala wat gusto nyo ipaluto at kayo n bahala sa sahog. 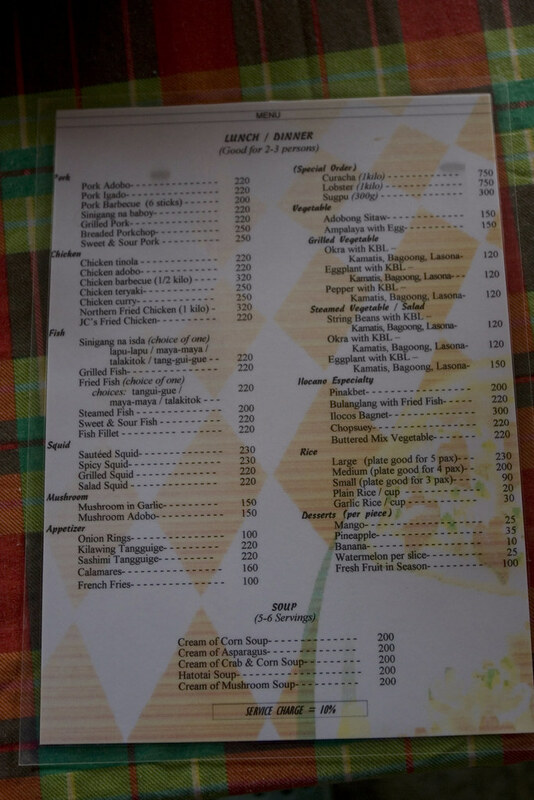 Pero kung sa menu naman nila. Mura din. msarap sinigang nila promise. gabi gabi un inoorder ko para lutuin nila nung nandun kame. hahaha. May car ba kayo or wala, pag gusto nyo ng touring nsa blog ko ung number ni kuya lenzer. mababa rate nya compared sa mga prices sa hotel tourings. On the way to Pagudpud, one must stop at Pasuquin Bakery (at Pasuquin, the town after Bacarra (which is after Laoag). They have good biscocho (different from Bacolod’s) which goes really well with cream cheese. A good hole-in-the-wall lunch stop is Northwind Canteen (a simple turo-turo along the highway beside Bangui Public Market). Order the crunchiest bagnet there! Try their kalabasa dinengdeng (with tinapa flakes) if it’s available when you visit. Kapuluan Vista resort is a very nice resort in Blue Lagoon, Pagudpud! =) they also have really good food at reasonable prices (was shocked at the menu you posted from one Saud resort!) You have to try Kapuluan’s burritos & their Garlic & Herb Pasta w/ Chicken! They use the juiciest sweetest tomatoes organically grown there! I gulp down glasses of their Calamansi Freezee during day time & their lambanog margarita is famous for casual drinking & talking after dinner! The owners are also very friendly & warm. I work in Laoag & our favorite weekend activity is to go to Kapuluan, attempt to surf or enjoy blue lagoon’s waves & at the end of the day, have drinks (with Flamin’ Hot Cheetos dipped in Philadelphia Cream Cheese) & talk with the owners (Alma & Mike) and their very interesting guests from around the world! One word of caution though, order at least an hour before you intend to eat because they only cook as you order. I am so glad my work brings me to wonderful places like Ilocos! yeah.quite expensive.but you guys can also try at emohrou.they have big servings. my friends and i are planning to go to pagudpod this april and are looking for a nice beach resort. searched the web and found Apo Idon Beach Hotel (http://apoidon.mozcom.com)…quite expensive, i guess, but the place looks great..according to the site at least. Do you have other contact numbers of Villa Del Mar? Coz these nos. cant be reach +63 920 553-4161 & +77 764-1080.
hi..my kids and i stayed in pagudgud for 3 days 3summers ago..we were backpackers and we stayed in NORTH RIDGE bec they said it was one of the cheapest resort..well it was decently priced…so decent that the owner will allow you to haggle the price of their room….theyre ilocano couple and were very kind..they dont have a resto but they offered to do the marketing and cooking for us so as not to spend so much on the other resort’s resto (which i think was wise)…they also offered to do our laundry and its up to us how much we’ll pay them..
we werent looking for some high end comfort when we went there…all we want is a comfortable place to stay without spending too much and we were satisfied..we plan to go there again come summer and probably we’ll stay a bit longer. hi gold, do u have a contact number for North ridge and if u now any other affordable places to stay in pagudpud. thanks! btw…NORTH RIDGE is on the rocky end but its just a few meters away from the sandy part..
sometimes the natives would offer you fresh catch like kuracha etc..prepare to haggle half as much as possible…then you can ask the resort to cook it for you. hello! im interested in HOMESTAYs in Saud beach, anyone here who knows their contact numbers? my friends and i were planning to visit pagudpud this april. Please email me the contact numbers of the one u mentioned in the blog re: “homestays in saud” which are accredited by DOT? My family & I is planning to go there this holy week for 3 days? I think we can afford that rate of P250/head/night?Please email me asap. Thank you so much. Hi! I suggest you check out this itinerary from Wikipilipinas. Hi! my husband and I plan to go to Pagudpud in April 12-13 overnight stay lang. We want to enjoy the beach. Kaya sana we are checking the cheapest rates for overnight room accomodations. Can we have the number for Apo Idon? Or Pannzian where we can put up tents? Kung may nakakaalam ng current rates nila for summer? Hey guys! Polaris sounds perfect for my group. Could anyone post a contact number please? thank you! Hello! Sobra ko na enjoy ang pag read sa mga comments and i think i got some tips from all of you guys..coz im surfing a lot of places to go this holyweek for very reasonable price,,we are all in a tight budget ryt?hehehe but ofcourse we want to enjoy it,to relax,unwind kc super stress sa work.. I wanna suprise my hubby kc,,he’s very homebody and im adventurer,,i wanna go different places when i find time and i think this is it!=P But the thing is how can we get there?from which bus terminal?we are from cavite..are we going to take a bus going to baguio first then transfer on the way to pagudpud?HELP!i only have 2days left for this to accomplish..thanks and god bless.. more power!!! Is there a resort with swimming pool? i dont know if you’ll be able to book an room accomodation w/ 2 days planning. we all know that the holyweek is one of the peakest season of summer. i myself am planning a trip to pagudpod, but so far found no luck in getting in touch w/ either polaris or villa del mar w/ the nos. i gathered from the web. i think the best & cheapest way to go to pagudpod if you dont have your own car is thru a bus. hi to everybody! i enjoyed reading all your tips. just another question, is there a place perfect for newly weds? we plan to go to pagudpud after our wedding. a nice place, reasonable price (syemps!) and yung talagang ma eenjoy namin yung first days namin together as a couple..hehe…with all the nice, cool and fun things we can do like massage, water for swim, tour and everything or if you can suggest things or activities we can do too i will really appreciate it. if anyone knows a place please include the contact nos. or website(if they have). looking forward and will really appreciate your reply. THANKIES! Hi same here can i have the info on POLARIS, who to contact . meal is just below P100 =P taste really good!!! hope makatulong sa lahat ng nagpa plan jan hehehe..
basta lakas lang ng loob and pray..happy trip! hi my barkada and i are planning to go to pagudpud because we heard nga that there are beautiful beaches there.. it is called nga daw boracay of the north.. any suggestion where to stay? as i am reading the comments polaris is really ideal for barkadas.. please let me know the number of polaris.. and one more thing can you pls tell me how long laoag airport to polaris beach resort is? send it to my email thank you so much we hope you could help us please! Where can we catch Partas bus? Or do they have a terminal? How much is the budget for an overnight stay? onga san yung terminal ng partas bus at magkano ang one-way fare nila? kelangan pa ba magpareserve sakanila few days before? you should have gone to kapuluan vista resort, just a short walk/ride from blue lagoon! Hello ther! we’r from Zamboanga and wer planning 2 go north for summer vacation. we went 2 pagudpud last 2006 and we stayed at arinaya beach resort. we love the place coz its beach front and very affordable. they gave me their cell number before but i think they change numbers. i hopeyou can email me their new contact numbers. thanks! God Bless! i wuld like to knw the exact amount if we would take the bus in going to Pagudpud. In addition to that I also would like to know kung paano makakapunta at makakapagstay sa mga homestays? thank you. It would help a lot. Please check this itinerary. It has lots of tips and guides, including budget and hotels or inns where you can stay at Pagudpud. me and my friends are planning to visit pagupod this april789. i would to know if you have any contact nos. of POLARIS. what other things can you suggest that we can do in pagudpod? and by the way the comments here are helping us a lot and making us more excited to see pagudpod. You guys should also try farinas bus.. they travel from manila to laoag and vise versa. They have these deluxe buses with cr…. their bus terminal is in sampaloc and you can contact them at 7438580. Magkano ang fares ng mga bus liners kapag deluxe? hi..i’ve been to ilocos during our ilocandia tour last september..we spent our last night in villa del mar in pagudpud..the place is so nice though it was raining hard. usually all station can be found in cubao..just ask the driver or conductor to lead you where the station is..
thats where we stay almost 2 days na kc early morning kmi dumating sa house na pinaparent nila(actually thats a room with CR but she let us only pay 1day =P coz the first day in pagudpud was nag tour kmi ng hubby q.
if like nyo talaga ma enjoy ang tour nyo try to visit nadin VIGAN,,from where my friends went to before going to pagudpud waaahhh..sayang kc nandun nadin naman kmi,,kulang lang sa time..
Hello there! Can you/anyone give me the email address/es and contact number/s of people at Polaris Beach Resort? Are there cheap beach resorts/homestays at Blue Lagoon Area? (I saw the pictures on Blue Lagoon and I instantly fell in love with the remoteness!) lol I’m not so much into crowded resorts…let alone overcrowded. For those of you who will be in Pagudpud on the endweek of April, a friend and I are coming on the 24th until 28th, so I hope to meet you there for FOOD TRIP! That is something I can’t live without. That lady who mentioned about the homestay and tricy driver, THANK YOU SOO MUCH! YOu were of great help. we learned that for Florida and RCJ bus, you need to get reservations. Partas does not accept reservations and only RCJ among the three accept aisle seating. we were desperate to get on a bus as early as possible so we got aisle seats (monobloc seating). we were able to get real seats though when those who had reservations came in late. we paid Php550. the tricycle driver whom we flagged down after hopping off the bus was very kind, bringing us from place to place so we could look for a place we can afford. and there we learned that in pagudpud, homestays can either be expensive or very cheap. the one we stayed in near tera rika resort (because every suggested resorts were fully booked already) cost us PhP1500 but some girls we met there were able to get a homestay place for only 250/head. this is near the polaris beach resort. for the search of a good place to stay in, we paid him Php50. believe me, it was very cheap with all the stops and asking he did for us just to get a place. manong lito, the driver, also offered us a tour of the area. his trip costs Php600, either north or south area. for both areas, it’s Php1200. not bad because for that amount we were able to go to bangui windmills, cape bojeador, kabigan falls, bantay abot cave, agua verde (?) resort, blue lagoon. he also stops at every place we wanted so we could just get our pictures. he even became our camera man! he also talks to the locals for us when we need to ask a lot of questions. best of all, he’s one of the DOT accredited tricycle drivers there so he knows all a tour guide should know. if you need his services, which i am recommending, you can call/txt manong lito at 09266709995. if you can’t really find a place to live in, he can offer transient stay at his house. going back, we decided to catch a bus (Php 70) to laoag and from there, took another bus to vigan (Php100). but before leaving laoag, we were able to visit the ilocano museum which is walking distance from the bus station, the st william’s cathedral and the city hall. at vigan, we stayed at cordillera inn. for Php1500, our twin-room was airconditioned, with cable tv, hot shower and breakfast and it’s right on calle crisologo (the cobbled street, for those who are not familiar with the street name). via calesa, we were able to see the 1500s belfry, try pottery at the banga factory, and crisologo museum. that’s only in an hour! and it cost us only Php150. so that’s it, anton! thanks! and have a pleasant trip to pagudpud everyone! Hi! I am booked in a hotel in vigan. Do you know which resort in pagudpud I can go just for day use? I’ve been to Pagudpud last weekend. Its my first time. I find it the beach there nice and clean. But i don’t recommend Apo Idon because of so many unpleasant experiences in my short stay there. hi po…. magpapagudpod kami 2nd week of may and we want to take the florida bus. ayon po sa post sa itaas, me reservations un. pede pa pareserve sa phone? ano po phone number nila? or in person?pay agad ng tickets upon reservation? Can someone please post the contact details of polaris? Pretty please. Tnx in advance. HI! do we have resorts there in pagudpud that has swimming pool. thanks then! The newest and most decent lodging in Pagudpud and esp. Blue Lagoon area is Punta Azul. The price is affordable considering its amenities that it offers. The building is new w/ individual floor to ceiling granite tiles w/ tub and shower in each room. We offer complimentary brkfast. The building is two level w/ wood floors and patio over looking the sea.It is located just a few steps from the beach.You forgot your toiletries ? We provide them for you at no xtra cost. By mid July all four buildings will be in complete operation.Mark your calendar and see you there. Pwede po ba malaman contact details nyo? i am looking for a place,we are going to pagudpud on May 10, and planning an overnight stay…. do you have rooms for 7-10 people? Magkano po ang rates? our company was planing to have an outing there but still i cant find the right place i already talk to different resorts for reservations and i already read almost all the comments her but which is better POLARIS? VILLA DEL MAR or JUN AND CAROL? can i have your contact number? me and my bf will be in ilocos may 31 to june 2 and would like to visit pagudpud. Me and my partner was planning to spend our 1st year anniv @ pagudpud on last week of July, but We’re not really familiar with the place, I need some suggestions where to stay,that is very affordable, and what place to visit? Hi we just went to pagudpud 2wks ago and we’ve got a cheap place to stay for 1,500 with aircon and actually the room is good for 4 persons imagine if you are four u cud only spend 375 pesos each nyt:) and the place is nice and clean, isn’t that a great deal? and its only 5mins. away to the beach. If you are interested u cud contact Kuya Boyet at 09214954092, he is so accommodating and can also tour you around the pgudpud. can i have your contact number? me and my gf will be in pagudpud on may 1 & 2. can you please email me the room rates of punta azul? hi! na-search ko lang sa yahoo 2ng thread about pagudpod. any suggestions kung saan maganda and affordable mag-stay sa pagudpud? we’re leaving on may 2 and babalik d2 sa manila on may 4. btw, 4 pax kami. thanks! I bet there is the wrong number posted by: Allan Roy Uy | Apr 8, 2008 6:34:45 PM.. I have tried calling the number and a girl answered the phone to which is grumping over received text and calls with her number. She has no more idea about pagudpud either. Please correct the info.. Need a place to stay at Blue Lagoon? Punta Azul Beach Resort is now open for business. Watch out for the coming TV show of Trip Na Trip featuring Blue Lagoon on August 15, 2008. We are hoping they will show our very own Punta Azul Beach Resort. Maira-ira – Beautiful white sand beach. Kabigan Falls – Trek to a breathtaking view of a long strip of water cascading into the deep pool below. Mabaga Falls – Mountain climb leading up to some of the most majestic waterfalls you will ever see. Pagudpud Viaduct – The Pagudpud viaduct is a scenic view and it looks the best when there is no storm. Set your picnic blanket at Aqua Grande – The idea of the picnic thing is up to you though. You could just stop by there and take pictures. Stop by Paraiso ni Anton – Beside the grotto is a stream nearby that is connected to Kaibigan Falls. Visit Blue Lagoon and swim! – The Blue Lagoon is not yet commercialized though the view of the clear blue water is very soothing and relaxing. 1st stop: Cape Bojeador is located in Burgos, Ilocos Norte, 45-1 hour away from the town of Pagudpud. It is known for being the highest lighthouse in the Philippines that is still functioning since its completion on March 30, 1892. To date, the Cape Bojeador Lighthouse still gives signals to passing ships along the Cape. The place is perfect for viewing the sunset but since this is your first stop, you would definitely miss it, not unless you have decided to make it your last stop. 2nd stop: Bangui Windmills is also outside Pagudpud, as the name implies, it is situated in the town of Bangui, Ilocos Norte, 30 minutes away from Pagudpud. Seeing the windmills for the first time will definitely leave you speechless, not to mention giant windmills that look like white robots or aliens. These giant electric fans are used to generate electricity in the province and at the same time, serve as a major tourist spot in Ilocos Norte. 3rd stop: Trek for almost 30 minutes to get to Kaibigan Falls. Not so steep falls in the middle of a forest but still worth the trek. Water is freezing cold. Entrance fee is Php 10.00 and there’s a hired tour guide for the trek. Any amount for the guide, as long as it’s reasonable, would do. Php 50 is enough but if you are feeling a little bit generous, Php 100.00 is much better. 5th stop: After lunch, journey to Patapat Viaduct and marvel at the view of the South China Sea. This is the only road you have to pass through in order for you to reach Cagayan from Pagudpud. This elevated concrete highway constructed along winding/rocky headlands is constructed to solve the problem of landslides in the area that have caused many vehicular accidents in the past. 6th stop: You can opt not to enter or enter Aqua Grande because there’s really nothing special about the place. Just a freezing cold river full of big rocks that meets the sea. Entrance is Php15. 7th stop: Near Aqua Grande is the Paraiso ni Anton. Don’t ask who Anton is because no one knows who he really is. Like Aqua Grande, nothing’s very special about this place so this might just bore you. It is just a mini fall with steps to the grotto where one can drink from the water coming from the falls. Travelers who pass by to go to Cagayan usually get water here. There are also mini stalls there where you can buy some pasalubongs. 8th stop: Bantay Abot Cave is a must see tourist attraction in Pagudpud. Bantay Abot is a natural sculptured cave which has a hole in the center. The place is very nice for picture takings and offers a great view of the sea as well. 9th and last stop: The last stop for the day and the tour’s highlight is at Blue Lagoon, which is commonly known as the “Boracay of the North.” The water is crystal blue as the name implies. The powdery, white sand is very fine like that of Boracay and to top it off, the place is not overcrowded. But if you are someone who loves parties, rubbing elbows with strangers and seashore orgies, then this place is not for you. Read this, Pagudpud has NO NIGHT LIFE. Waves are really big so if you’re not a good swimmer, better shun away from the idea of swimming far from the shore. Optional: Since Blue Lagoon is facing west and if ever you are not staying in Saud Beach but still want to see a perfect sunset, you can ask your friendly tour guide to drop by at Saud Beach just in time before the sun bids farewell. *No additional charge for children 10 and under when sharing room with adults. *Check out time is strictly at 12:00 Noon. Inclusions: Room accommodation in air-conditioned room/s with own T&B and hot water for shower. Assistance of a resort guide/lifeguard to Pannzian beach, river and spring. Note: Pls. be at Florida bus terminal 30 minutes before your 8pm trip. Pannzian can do the reservation for you. Pls. call to remind/confirm 2 days before. To confirm your booking, full payment is required to be deposited to the METROBANK (Marikina) CA# 007-316-004802 of PANNZIAN on or before October 29,2008, otherwise your booking reservation is automatically cancelled. Please fax your deposit slip to 6827844 and keep it. This serves as your temporary OR. An official receipt will be issued in PANNZIAN. Food and other incidental charges must be settled before check out. Full payment shall be forfeited for cancellation made less than 2 days before the arrival date. Fifty percent shall be forfeited for cancellation made 5-2 days before the arrival date. Automatic cancellation for all reserved dates and full payment for no show. Register at the resort’s reception upon check in. Coordinate with the resort manager regarding your resort itinerary/activities during the duration of your stay. Be guided accordingly by the resort’s HOUSE RULES. Pannzian has Ka-yo Restaurant for your meals. Bringing in and cooking food is absolutely not allowed. Only SMART cell site is available in Pannzian. Globe is only up to Pagudpud Bayan and Adams. Note: If your tour starts from Vigan, please go to the other way. From Vigan, proceed to Badoc, then Batac, etc. Your last stop before reaching Pannzian is Bangui Viewdeck. Reserve your visit to Pagudpud bayan and Ilocos- Cagayan viewdeck as a part of your itinerary while at Pannzian. Automatic cancellation for all reserved dates and full payment penalty for no show. Take the North Expressway at Balintawak and get off at Dau exit. Head for the coastal road. You will pass by Angeles City, Tarlac, Urdaneta, Pozzorubio, and Rosario. Proceed further north, past San Fernando (La Union), Vigan (Ilocos Sur), and Laoag (Ilocos Norte). Take the road towards Cagayan to reach Pagudpud. It is the fifth town from Laoag City. My friends and I are planning to have a trip in Pagudpud this coming 31st of October until 2nd of November. I’ve decided to make a booking in POLARIS BEACH, maybe one of this days. Just one qustion, do they have a tour package? Im having a problem with that one kasi kung pano ang sasakyan pagdating don since commute lang kami. Hope to hear your cooments and reccomentdations. I’m planning a trip to Pagudpod and Vigan from Dec. 25-30. Do you think this is a good idea? I’m worried that some establishments and must-see spots might be closed, or the caretaker might be away, etc. because of the holidays. di kau magsisise, his very kind. We would like to ask if you could add us in your list of beach resorts in Pagudpud here in your website. hi anton my family and i are planning to spend our post xmas vacation at Pagudpud. I was able to talk to Manang Dolores who happens to own one of the homestays in Pagudpud. I read the comment of a certain Andrew and I am very much interested to SEE a picture of Manang Dolores’house where they stayed. Would that be possible? hi! i together with my 3 other friends are planning to go to Pagudpud on April 17 2009, but i don’t know where to stay and also i would like to know how to get to Maira-ira beach? good day, michelle!my friends and i are planning on a 4 day trip to ilocos, a road trip. do you have any suggestions? i read that you’ve been on the same trip. was it worth it? Hi Anton! any updates on the pagudpud experience? my friends and i are perplexed. hehe we seem to be settled with Saud Resort but are worried about food. are there places offering pa-luto? homestay style sana pero we have no connections to guide us to where these homes are. Super thanks! This site was invaluable to us while we were planning our road-trip to Pagudpud. Thanks so much for being so generous with all this information! We spent 2 excellent days at Maira-ira on the last week of May, 2009, and your tips and a host of other blogs made that possible. The thing is, we weren’t even booked at Maira-ira. We were actually booked at Villa del Mar on Saud Beach, on the recommendation of a friend. I know how I trawled blogs for reviews and tips, our experience needs to be out there for someone else to consider on their next vacation. We’re a family of four, 2 adults, a teenager and a 10-year old boy. I am the lone rose among the etc. We aren’t picky, we believe that if the accommodations match the situation, then it’s all good. However, there are things where we won’t settle for less. On those rare occasions where budget permits, and we are willing to pay a higher than average price for quality and comfort – I damned well better get that quality and comfort. Villa de Mar had a very spacious family cottage with a queen sized bed, two double beds and a single bed. We wanted immediate access to the beach so we thought the P4,500 a night for the cottage was certainly worth it. We arrived at 1pm and discovered that they had our reservation wrong – they booked 2 family cottages for one night (we’re a family of 4) when we asked for 1 family cottage for 2 nights. Anyway, neither cottage was free yet. So we had lunch first, with bagnet set at a ridiculous price and an even more ridiculous tiny serving, the food was on the bland and expensive side. At 2:30 the cottage still wasn’t ready and our WAITER ended up cleaning the room himself. Here’s the thing. If a room has modern bathroom fixtures and you charge people for board, I expect the bathrooms to be clean. Not beautiful, just clean. When we moved in, we discovered a shower head that didn’t work, there was a pail and tabo presumably because management was aware of the defective shower head so they put the pail there to “address that”. The pail, tabo, and even the inside of the toilet had a slimy, yellow-tinged amag residue on them. The door to the bathroom was spotted with mold and broken on the bottom due to wood rot. The whole cottage smelled of aparador in the middle of the monsoon season. If you advertise on the internet, and present your rooms in a certain way, I expect the actual accommodations to be true to the advertising or vice-versa. The resort is in a state of disrepair. No mincing words. The cottage interior is about 10 years older than the website photos. That set-up is NOT worth P4,500 of anyone’s hard-earned cash – unless of course if there are 10 of you sharing a room. This is this age of word-of-mouth and online reviews, I ignored the warning signs of poor reviews of Villa del Mar. That same day we decided to drive out to check Kapuluan Resort, we loved it immediately and returned for our things at Villa del Mar. The poor blokes manning the front desk have ZERO decision-making abilities. When I noticed the OIC hewing and hawing and giving the security guard the eye (like we would run) I said calmly “I have already paid the advance of 50% for 2 nights – P4,500”. THEN he accepts my keys and lets us leave, with a “sorry na lang ma’am”. I was respectful, and not even cranky. It’s not his resort. But do you think anyone called me to offer to return my P4,500? Did anyone contact me to find out why we left and defaulted on that amount of money? Obviously not. It is so sad that a few of the resort owners along Saud Beach in Pagudpud have slipped into complacency and think that they’re doing the tourists a favor just by being there. At the very least, if your room is old and is as barely made-up as this one was, then charge a price commensurate to the quality of the room! Hi Anton! My husband and I are planning to fly to Ilocos sometime August and I’m trying to get ideas on place where we can stay. I was thinking of Kapuluan Vista Resort. I’m wondering though, why you recommended Kapuluan only for the “third timers?” Thanks. It is actually quite far but this is my favorite resort now… I love the serenity of blue lagoon but a lot of people discovered it already so on peak season there is quite a crowd. im planning to go to pagudpud and stay in one of the resorts (kapuluan or villa del mar), but i want to ask if i stay at these resorts, are they far from the tourist spots like bangui windmills, paoay church, fort ilocandia, etc.? i plan to stay there for 3-4 days. and i plan to bring my car all the way from manila. hope to get your feedback before i finalize my trip. Yes they are quite far so you need to pass by through these tourist sites before reaching Pagudpud. lyn, try niyo punta azul. nice sya for families kasi parang bahay talaga pag-stayan niyo. We love to stay in Kinapuluan Vista Resort in the Blue Lagoon area. hi anton, gud pm there! kindly try seeing hannah’s beach resort and convention center located at the blue lagoon in pagudpud ilocos norte. Promise you will be delighted ..
‘wish to see you there sir! Yeah , ms lanie is right !.. We’ve been thre during the holidays and we found the place a wonderful one. Although it was raining then, still we enjoyed the waves. Surely, we will go back come summer time . I would like to request if you can add us in your list of beach resorts in Pagudpud Ilocos Norte in your website. Our place, Hannah’s Beach Resort and Convention Center..
CAn somebody give an update on this post? My partner and I are planning to go to Pagudpod sometime on May. So anyone? hi!can anyone know kung saan ako mka2tipid ng homestay for overnyt only, sa may blue lagoon or near hannah’s resort at pwde din magrent ng tent. mga 15 to 20 persons by last week of june. plz help…. email me at [email protected]. salamat! I’ve been in Pagudpud last weekend (april 20-22) i can say that its a very nice place. Its worth the long drive. We stayed at Polaris Beach resort on our first night, very accomodating staffs. And we transferred to SABRINA BEACH RESORT the following day due to lack of rooms in polaris. I STRONGLY SUGGEST NOT TO STAY IN SABRINA BEACH RESORT. We had a very bad experience in this resort, they have a super hot rooms, literally WARM room even if A/c’s ON. And the worst part is they have a very RUDE staffs namely Herminia and Romy. Hi Anton. Your reviews have been very helpful for many of my family’s travels. I’d like to share our experiences from our recent trip to Pagudpud. We drove there from Manila for the Holy Week. We were not able to secure prior reservations so we thought of just asking around. Surely enough, we had a hard time looking for a place to stay, aggravated by the fact that there were 6 of us. We chanced upon CASA VICTORIA BEACH RESORT and they said they had one family room (capacity of 8 pax) left for Php 9,000 per night. We thought it was pretty steep but getting a bit desperate, we grabbed it anyway. After having settled, I decided to check out the other resorts. I found Terra Rikka’s family room costs Php 10,000 per night but accommodates 10-12 people, had good air-conditioning and a bathtub. I found Saud Beach Resort to cost about just as much but had full-board buffet meals inclusive. I found Polaris Resort’s room similar to ours to cost only Php 6,000. With what we paid, we expected exceptional service. But it wasn’t the case either. The food was undercooked (even the rice), water pressure was low, voltage was unstable (aircon kept dying and restarting and was rendered useless), CR door has no lock, and when we asked to speak to the manager, they gave us the run-around. But if you think we had it bad, the family next ours drove straight all the way from Sta. Rosa, Laguna. Hi! i Just want to know kung ok pa ung number ni Manang Dolor na nakalagay sa comments. i’ve been to her place noong november 2008, but it’s my friend who saved her number. she told me that it’s available online. please help. thanks! Ten of us went to Ilocos Norte last weekend. Pagudpud is of course in the itinerary. In Brgy Saud, the biggest stretch of white sand beach shoreline is fronting Saud beach resort. We booked initially with palm grove and we were made to believe that is was beach front. It was not. So when we saw the place (surrounded by high hollow blocked fence) upon arrival, we cancelled our reservation. There are other beach front lodging places like Arinaya, Vista del mar, casa victoria. But these were fully booked. So we opted for Britanya Lodge which is not beach front but was more open space and has friendly atmosphere. But the beach was with many jelly fish. In fact, one of our companions is still recuperating with the jelly fish’s sting even if vinegar was applied on the area. WOULD BE TOURISTS! THE BEACH IS WITH SO MANY JELLY FISH. IF YOUR GOAL IS TO GO SWIMMING, PAGUDPUD IS NOT YOUR PLACE. BUT IF YOU WANT ADVENTURE AND WANT TO KNOW MORE OF OUR HISTORY, Ilocos Norte is still a place to explore..
We’re planning to go to Pagudpud by May, this will be my 3rd time though, as per your suggestion, Kapuluan Vista resort is great, but its quiet far. We are also considering Apo Idon in Saud, but you also mentioned that its in the rocky shore part of Saud. So does this mean that the beach is not recommended for swimming?